Figure 1. 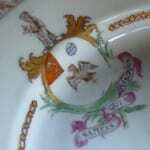 Chinese porcelain plate decorated with the arms of Charles Raymond and his wife, Sarah Webster. c.1760. Private collection. Image courtesy of Georgina Green. Please note that this case study was first published on blogs.ucl.ac.uk/eicah in June 2014. It was last checked by the project team on 19 August 2014. For citation advice, visit ‘Using the website’. 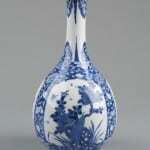 Chinese porcelain services specially commissioned by individuals and families to include their coats of arms within the decorative scheme were distinctly fashionable and popular in eighteenth-century Britain, particularly among those with East India Company connections. Armorial porcelain services feature in various East India Company at Home case studies, including Osterley Park and House, Valentines Mansion and Gardens (see figure 1) and the Shugborough Estate. This case study takes a closer look at armorial wares and questions the identity politics embedded in porcelain pieces decorated with coats of arms. 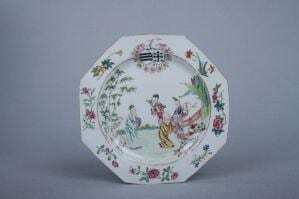 British houses first included Chinese armorial porcelain services at the turn of the eighteenth century. Obtaining these wares was notoriously difficult as many different people were involved in the ordering, production and transportation processes. The only means of acquiring armorial services were by placing a commission through a supercargo officer involved in trade with China, working with a dealer who had connections to a supercargo, or (for those based in India) through engaging with country trade between India and China. Supercargoes were particularly important to armorial porcelain commissions. As individuals who worked for the East India Company, they were responsible for dealing with Chinese merchants in Canton. They oversaw the purchase of bulk commodities for the Company, such as tea. 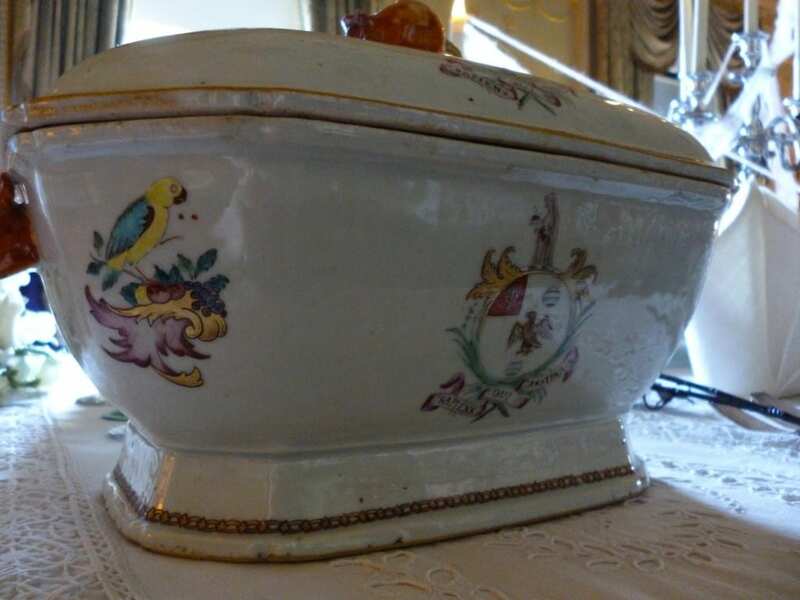 Alongside negotiating purchases and supplies, supercargoes executed private trade and were well placed to fulfill commissions for particular objects such as porcelain services decorated with heraldic symbols. In placing a commission the supercargo would pass on written instructions and sketches to Chinese decorators often based in Canton, who would then paint the necessary armorial design onto a series of porcelain forms obtained from the ceramic factories in Jingdezhen, which (by the early eighteenth century) had long produced forms to European tastes. Working from written English instructions and sketches, Chinese decorators made mistakes (a point perhaps overly noted by historians). Dolphins replaced birds and bear claws transmuted into clumps of grass, reworking the coat of arms and creating entirely new meanings. Nevertheless, these services proved particularly popular with East India Company directors, captains and supercargoes, who had the connections and wealth necessary to commission them. Robert Finlay estimates that in the eighteenth century more than half of all East India Company directors, captains and supercargoes purchased armorial dinner and tea services. In total English buyers commissioned around 5,000 armorial sets, with some going to regiments and societies. Families such as the Lascelles and the Beckfords, who gained fortunes through their involvement in Caribbean slavery and the slave trade, also commissioned these wares. Surviving examples inform us that these armorial services were extraordinarily elaborate, with some containing more than 500 pieces. Services included not only dining ware such as plates, dishes, hot-water plates, soup tureens and sauce boats, but also items for large entertainments (such as punch bowls), decoration (pierced baskets and vases) and the tea table (coffee and chocolate pots, teapots, teapoys, caddies, milk jugs, spoon trays and sweetmeat dishes, cups and saucers). Commissioning a complete service thus involved a substantial outlay of money. A service (including shipping and custom duties) cost around £100 (roughly £11,000 today) in the early eighteenth century. Although it took around three years (from order to delivery) for these services to arrive, the difficulties undertaken in obtaining them were perhaps one of their most desirable features. At the same time, bearing coats of arms, these exclusive objects were able to provide families with a sense of name, identity and lineage. This case study examines the identity politics that Britons embedded in armorial porcelain services during the long eighteenth century. It considers how family names were displayed and bolstered as a result of owning dinner plates bearing a particular coat of arms. It also asks whether the plates, dishes and sauceboats that made up lavish armorial dinner services actively shaped other identities. Principally, it asks, were armorial services gendered? If so, how, and why? While many scholars have explored the relationship between women and porcelain in the eighteenth century, I suggest that armorial porcelain allows us to consider the relationships that contemporaries conceived as existing between men and this highly prized translucent material. In exploring these questions, this case study investigates the place Chinese porcelain held within British culture and the ways in which British citizens used Chinese porcelain to perform specific cultural work. Figure 2. Tureen from armorial Chinese porcelain service, Qianlong reign (1736-96), c.1765-70. 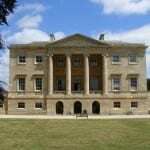 Basildon Park, National Trust. Image courtesy of Kate Smith. While the arguments explored below could be examined through the Osterley, Shugborough or Valentines service, this case study focuses on a different set of wares – those purchased by Francis Sykes of Basildon Park, Berkshire in the 1760s (see for example figure 2). Sykes worked at the East India Company’s Cossimbazar factory in Bengal between 1751 and 1761 (rising to chief of the factory in 1760) and then served between 1764 and 1769 as Resident at Murshidabad and as also as chief of the Cossimbazar factory from 1766 onwards. From the scant documentary sources left by Sykes, it is difficult to interpret exactly why and how he purchased his armorial service. 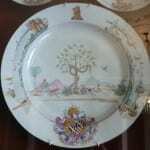 By situating his acquisition within the wider context of porcelain consumption and use, however, this case study suggests that East India Company men were keen to purchase armorial porcelain services for their country houses and town houses because Chinese porcelain acted as an important emblem of elite masculinity, while also signalling their place within East India Company hierarchy to their associates and the world at large. As Henry French and Mark Rothery remind us, in this period gender identities were not absolute. Nevertheless contemporaries ‘believed in the existence of such all-embracing behaviourial norms – even though they could not agree precisely on what these might be’. Elite men thus ‘conceived their gender identity by reference to a number of competing stereotypes, rather than in relation to a single, “hegemonic” form’. French and Rothery’s study suggests that certain attributes remained constantly significant for elite men throughout the period from 1660 to 1900, namely autonomy, honour, reputation and self-control. For East India Company officials keen to join, re-join or consolidate their position within Britain’s elites, armorial porcelain allowed them to enact and signify many of these attributes. The design of armorial wares, the modes by which they were acquired and their practices of use all allowed East India Company men to display and maintain their reputation, autonomy and honour. Armorial wares showed their lineage, as well as their relationship to networks of influence in spaces (such as the dining room) of male sociability. Is it possible then to understand Chinese armorial wares as distinctly male? If so, how did these wares shape British material cultures and does this change our understanding of Chinese porcelain and its role in British material cultures more generally? 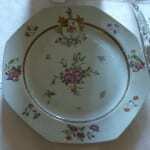 During the eighteenth century porcelain was synonymous with women. Porcelain was significant in providing a space in which different ideas about women, desire, sensuality, novelty, temptation and exchange could come together. In contrast, this study suggests that armorial wares were distinctly male – carrying a different set of connotations and meanings to other porcelain pieces. In the late 1760s, East India Company man Francis Sykes of Basildon Park in Berkshire commissioned and purchased an armorial porcelain service. In India at this time, Sykes would have had the necessary contacts, wealth and position to order an armorial service such as this. Modes of acquisition played important roles in gendering eighteenth-century objects. During the century, critics of newly emergent retail spaces and shopping practices often framed their comments in gendered terms, distinctly shaping what it meant to buy in particular spaces and through certain practices. Such understandings then shaped the goods purchased, layering meanings on objects. Coats of arms were primarily considered a male preserve, highlighting as they did the ideal of patrimony. The designs decorated onto armorial wares thus marked them as distinctly masculine. Although armorial porcelain services often included tea wares, the dinner service constituted an (perhaps the) important part. During the eighteenth century the dining room emerged as a male space, in which elite masculine ideals of sociability were performed. 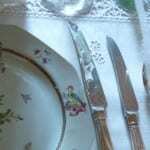 Used in such spaces, armorial porcelain wares became further marked as masculine. In considering the meaning of armorial porcelain services to eighteenth-century British society, this case study understands these global luxury goods in distinctly masculine terms. Acquired through East India Company networks, maintained through rigorous adherence to certain codes of reputation, honour and connection, these wares provided contemporaries with evidence of an individual’s ability to call on others and demand service and respect. The text and research for this case study were primarily authored by Research Fellow Kate Smith. Kate would like to thank Sir John Sykes for his comments and suggestions. Pauline Davies and Yuthika Sharma, ‘“A jaghire without a crime”: East India Company and the Indian Ocean Material World at Osterley 1700-1800’, The East India Company at Home, 1757-1857: http://blogs.ucl.ac.uk/eicah/osterley-park-middlesex/ (2013); Stephen McDowall, ‘Shugborough: Seat of the Earl of Lichfield’, The East India Company at Home, 1757-1857: http://blogs.ucl.ac.uk/eicah/shugborough-hall-staffordshire/ (2013); Georgina Green, ‘Valentines, the Raymonds and Company Material Culture’, The East IndiaCompany at Home, 1757-1857: http://blogs.ucl.ac.uk/eicah/case-studies-2/valentines-mansion/ (2012). David Sanctuary Howard argues that no large armorial services were made before the turn of the eighteenth century. See David Sanctuary Howard, Chinese Armorial Porcelain (London: Faber and Faber Limited, 1974), p. 36. Thanks to Meike Fellinger for alerting me to the importance of country trade in armorial porcelain service commissions. Sarah Richards, Eighteenth-Century Ceramics: Products for a Civilized Society (Manchester: Manchester University Press, 1999), p. 58. Robert Finlay, The Pilgrim Art: Cultures of Porcelain in World History (Berkeley, Los Angeles, London: University of California Press, 2010), p. 28. Finlay, The Pilgrim Art, p. 27. Howard, Chinese Armorial Porcelain, p. 75. Finlay, The Pilgrim Art, p. 28. For more on the ways in which literary scholars have examined eighteenth-century representations of the relationship between women and porcelain see Elizabeth Kowaleski-Wallace, Consuming Subjects: Women, Shopping, and Business in the Eighteenth Century (Columbia University Press: New York, 1997); David Porter, The Chinese Taste in Eighteenth-Century England (Cambridge: Cambridge University Press, 2010). See Davies and Sharma, ‘“A jaghire without a crime”: East India Company and the Indian Ocean Material World at Osterley 1700-1800’; McDowall, ‘Shugborough: Seat of the Earl of Lichfield’; Green, ‘Valentines, the Raymonds and Company Material Culture’. Henry French and Mark Rothery, Man’s Estate: Landed Gentry Masculinities, c. 1660-c.1900 (Oxford: Oxford University Press, 2012), p. 14. French and Rothery, Man’s Estate, p. 15. Ibid., p. 3 and p. 37.